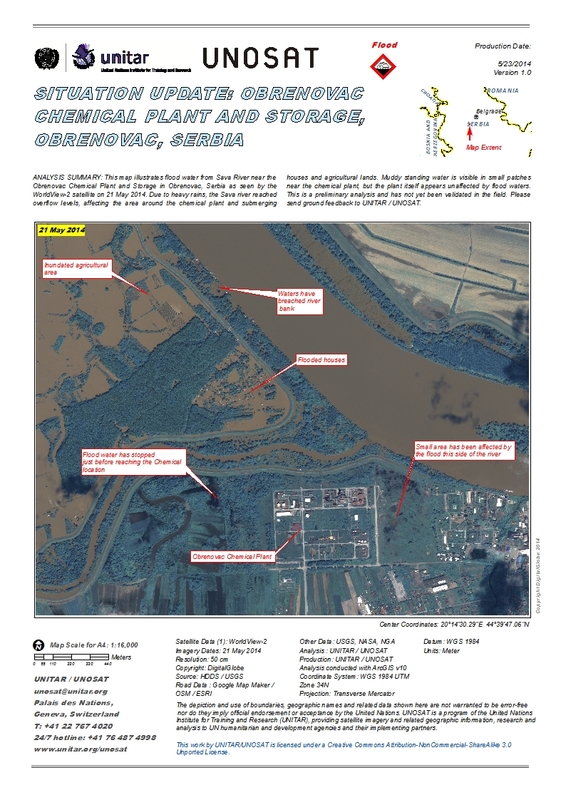 ANALYSIS SUMMARY: This map illustrates flood water from Sava River near the Obrenovac Chemical Plant and Storage in Obrenovac, Serbia as seen by the WorldView-2 satellite on 21 May 2014. Due to heavy rains, the Sava river reached overflow levels, affecting the area around the chemical plant and submerging houses and agricultural lands. Muddy standing water is visible in small patches near the chemical plant, but the plant itself appears unaffected by flood waters. This is a preliminary analysis and has not yet been validated in the field. Please send ground feedback to UNITAR / UNOSAT.